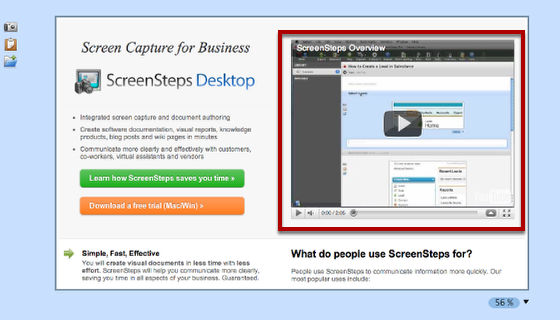 Learn how to use the annotations tools built into ScreenSteps. When you select an image (1) the annotation tools will appear on the toolbar (2). The current tools are Line, Rectangle, Oval, Sequence, Text and Blur. Just select a tool and draw on the image. In this example we have used the rectangle tool. 1. 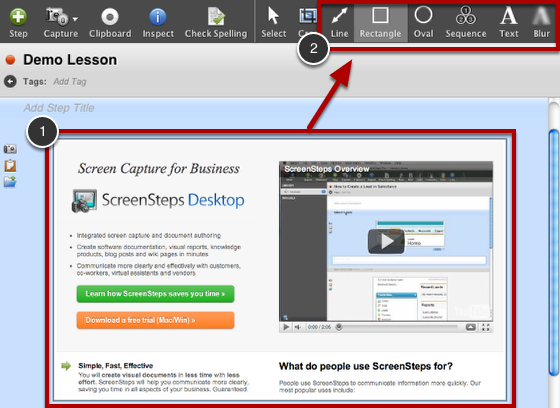 Select - use the Select tool to select, resize and delete annotations. Quick Tip: Press "s" to select this tool. 2. Crop - use this to crop images. Quick Tip: Press "c" to select this tool. Line - draw straight lines with or without arrows. 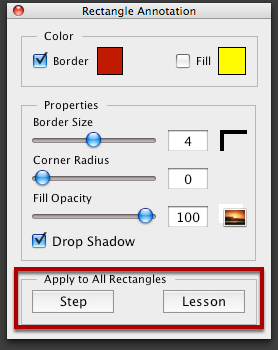 Rectangle - draw rectangles with or without fills. Oval - draw ovals with or without fills. Sequence - add numbers to your image. Text - add text annotations to your image. Blur - obfuscate sensitive information such as login names and passwords. Quick Tip: Press "a" to select in tool in turn. Hold down the "shift" key to select in reverse order. Open the Inspector to adjust colors, line thickness and fill as well as other parameters. You can update multiple annotations on the same step by clicking on the "Apply to All" buttons for the current annotation. This will update all annotations for the current Step or the entire Lesson depending on which option you select. It would be great to be able to change the size, color, and font of text annotations to a picture. @Bill: You can change these attributes using the Inspector Palette. With a text annotation selected just open the inspector and you can modify them. Is there any way to group annotations so I can copy and paste them for continuity? P.S. I just want to add that your Sequence annotation tool is the best thing about your whole program. That feature alone made it worth its price --it's nothing less than amazing. @Val - glad you like the sequence tool. ScreenSteps 2 doesn't support grouping or selecting multiple controls. In the next major upgrade we will support selecting multiple annotations so you can easily copy and move them. Great! Looking forward to the next upgrade. I am just learning how to use the program and already I have found so many things I LOVE about it. It's obvious you have somebody or somebodies) on your development team who actually do this kind of work and it shows. So many great features that I always wished I had in other programs I've used. @Val - There are only a handful of us but we all work on documentation in one form or another. Either for our own software, internal business processes, or for our hobbies. @Violet - being able to apply a preset annotation settings to an entire manual is something on our radar. I don't have a specific timeframe for when we will add it, however. I can seem to be able to select or otherwise get the "dots "to appear so I can delete my annotation. Instead , I see a longer menu that will delete the image. Any thoughts? @Lauren It sounds like you are right-clicking (or CONTROL + clicking on OS X) on the image area rather than clicking with the left mouse button on the annotation. Right-clicking shows a contextual menu like the one you describe.